Surgery to fuse the thoracic spine. Labelled artwork of an example of surgery and implants used to fuse part of the thoracic spine. At upper left is the corresponding X-ray showing the implants in place. At lower right is an artwork showing the location of the incision made in the patient's back to carry out this operation. 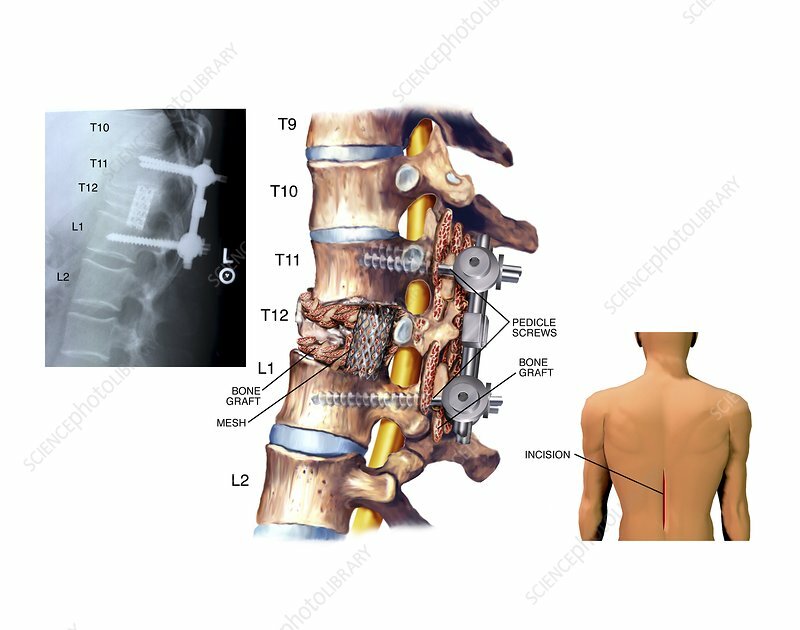 In the main artwork, the T12 vertebral body and the intervertebral discs either side have been removed (corpectomy and discectomy) and replaced with hip bone grafts and a supporting mesh. Further bone grafts (from the crest of the iliac hip bone) and rods fixed with pedicle screws to the T11 and L1 vertebrae bridge the gap.